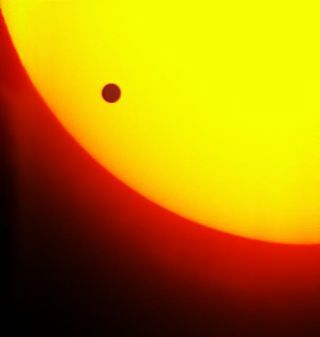 Scientists are gearing up for the upcoming transit of Venus, an extremely rare opportunity to watch the planet Venus pass in front of the sun as seen from Earth. Venus is due to make this cosmic crossing June 5-6 — the last time such an event will occur until 2117. When viewed through special solar filters or protective equipment, the transit should offer skywatchers and amateur astronomers an unforgettable sight, weather permitting. But the event is also a rare opportunity for scientists. As Venus transits the sun, sunlight will be filtered through the planet's atmosphere. By analyzing the absorption features in this light, researchers can learn more about the chemical elements present in the gaseous haze around Venus. Many of the world's premier telescopes will be trained on the sight, including NASA's Hubble Space Telescope and Solar Dynamics Observatory, as well as the European Space Agency's Venus Express satellite in orbit around Venus. The Venus Express science team will be watching, and broadcasting live, from the Arctic island of Spitsbergen. "We're very excited about watching the transit from such a unique European location while Venus Express is in orbit around the transiting planet," Venus Express project scientist Håkan Svedhem said in a statement. "During the transit, Venus Express will make important observations of Venus' atmosphere that will be compared with ground-based telescopes to help exoplanet hunters test their techniques." The 2004 transit provided scientists with the first opportunity to view such an event with modern equipment and telescopes. "Modern solar telescopes captured unprecedented view[s] of Venus’s atmosphere backlit by solar fire," astronomer Tony Phillips wrote on the Science@NASA blog. "They saw Venus transiting the sun's ghostly corona, and gliding past magnetic filaments big enough to swallow the planet whole." While scientists are excited for this year's Venus transit, they don't stand to learn quite as much as their counterparts did in the 18th century, when a pair of Venus transits in the 1760s have been described by modern historians as "the Apollo program of the 18th century," according to Phillips. Illustration of the Venus transit from James Ferguson's book Astronomy Explained. Then, astronomers had no way of measuring the absolute size of the solar system, until the Venus transits presented an opportunity to triangulate the distance to Venus by comparing measurements made from different vantage points on Earth. Scientists spread far and wide around the planet — famous explorer James Cook went to observe from Tahiti — however, bad weather and technical glitches prevented measurements of the accuracy scientists had hoped for. Now, researchers will be able to observe the transit with an accuracy 18th-century scientists could only dream of. In addition to studying the planet Venus, scientists plan to use the transit to test techniques they hope to wield studying alien planets beyond our solar system. Planetary transits are a key technique used to detect extrasolar planets, as these planets subtly dim the light of their parent stars when they pass in front, thus signifying their presence. Not only can researchers discover alien planets by searching for signs of these transits, but just as with Venus, they can learn about the planets' atmospheres by looking at the absorption features in the parent stars' light. "During next month's transit, astronomers will have the chance to test these techniques and add to the data collected during only six previous Venus transits observed since the invention of the telescope in the early 1600s," according to a European Space Agency statement.